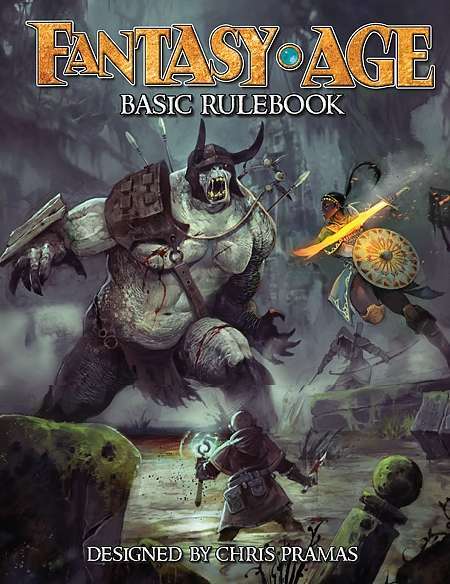 I’ve recently been reading the Fantasy AGE system (Fantasy AGE Basic Rulebook, Fantasy AGE Companion, and Fantasy AGE Bestiary), and while I don’t know it well enough to say I love it, I definitely like what I see so far. Character creation, once you get past the organization of the PDF, is frightfully simple. Roll stats, pick race (including rolling for racial benefits), roll background, pick class, then make a few choices within the class. Simple choices, you pick a certain number of elements from a list. Roll hit points and possibly magic points, pick your starting gear (every character starts with some basic gear, plus 1-3 weapons based on class and maybe some armor… and if you pick a bow you start with some arrows, if you know sword and shield style you get a shield). Roll money based on your background and perhaps do some shopping, and you’re basically done. With a bit of practice, or even just better bookmarks in the PDF, I would not be surprised to find this can be done in ten minutes, tops. Even with the limited choices involved you can still have a fairly broad range of starting characters. Differentiation and specialization comes later, largely through talent choices. Gameplay is about as simple. Checks are made with 3d6 (two of one color, the third — the ‘stunt die’ — of another color). Roll 3d6, add your ability score, add +2 if you have the focus being checked, and compare to the Target Number. If the roll is equal to or higher than the target number, you succeed. The off-color die serves several purposes. If your check succeeds and you rolled doubles (on any pair of dice), you get a number of ‘Stunt Points’ (SP) equal to the value of this die. You can then spend these Stunt Points for additional effect: moving yourself or your opponent, extra damage, an extra attack… or for spells, saving some Magic Points, increasing the spell’s area of effect, and so on… or while exploring, noticing something you weren’t even looking for, or socially managing to direct a conversation without people realizing you’re the one doing it. Stunt Points are applied in many ways. For longer, more complicated tasks you accumulate the value of the stunt die on successful checks until you’ve met your goal. A task that is simple but time-consuming might have a low Target Number but high Threshold, while a small but complicated task might have a high Target Number but low Threshold — you have to be very good to do this at all, but if you are that good, it doesn’t take long once you get a handle on it. It can also be used for things like chases, where you use basic checks (3d6+ability+focus) to get past obstacles and the stunt die to determine relative progress (if you don’t spend the SP for other things, I suppose. Combat is fairly straightforward. Make your attack check (3d6+ability+focus), and if it exceeds your target’s Defense (10+Dexterity+shield) you hit. Roll damage (weapon+Strength) and subtract your target’s Armor Rating (3..10 for light leather through heavy plate). Subtract from target’s hit points (Health) and continue. Yes, heavy plate can mean not being hurt by smaller weapons. This is part of where stunts come in. For 2 SP you can do a Mighty Blow inflicting an additional 1d6 points of damage. For 5 SP you can do a Lethal Blow inflicting 2d6 more damage. If your opponent is only lightly armored you might choose instead to spend 3 SP and make a Lightning Attack, rolling (without gaining SP) again for a second attack. If you have enough Stunt Points you can spend them on more than one stunt. Some can be used more than once in a single action (Skirmish can move an opponent or yourself more than once) but most can be used only once. Casting spells is much the same. Declare your spell, spend the Magic Points (MP), roll your check (3d6+ability+focus). If you rolled equal to or higher than the spell’s Target Number, the spell has effect. If the stunt die rolls stunt points, you can spend them on spell stunts (or possibly combat, depending on the spell). Talents are also very straightforward. There are basically three types to start: general talents, arcana, and specializations. Many talents are available to any class, but many are constrained to only one or two of the three classes. All talents have three ranks: Novice, Journeyman, and Master. Every time you gain a talent slot you can either take a new talent at the Novice rank, or increase the rank of a talent you already have. General talents cover the same ground as feats in other games. Some have requirements such as minimum ability scores or having certain focuses. Combat styles, social mechanisms, and so on are all covered to varying degrees. They’re almost always straightforward in application. Arcana are the purview of spell casters (mages only, as the rules are written). With novice rank you learn two novice spells of the arcana, journeyman rank gives you another spell of up to journeyman rank and Intelligence (this arcana) focus — good for +2 on all spell checks related to the arcana, and master rank gives you a fourth spell of up to master rank, and lets you pick a spell stunt you can use for one stunt point less (though if the cost is reduced to 0 you still have to have stunt points to use it, it just doesn’t cost any). In the Basic Rulebook each arcana has only two novice, one journeyman, and one master spell. The Companion adds two more novice spells, another journeyman spell, and another master spell to each arcana. This means each arcana lets you learn up to half the spells in the arcana. I’m not sure if I want to keep it that way and allow a new talent to give additional spell knowledge, or split the new and old spells into ‘Basic Arcana’ and ‘Advanced Arcana’. I’ll think about it. Specializations are talents that help shape your character. Where general talents are abilities (skills and feats), specializations are also labels of sorts — something like prestige classes in some games. The Animal Training talent gives you the ability to train animals. The Beastmaster specialization gives you an animal companion that grows with you, the ability to communicate with animals of the same type as your companion, and finally more companions and the ability to communicate with them. All in all, Fantasy AGE looks like a fairly tight package. There is a lot left for the GM to rule on, but even that looks pretty straightforward. At worst, you have the player make a check (ability is usually obvious, focus might need more consideration) against a Target Number. Character construction is really straightforward, as is game play. I think I’m going to like running this.